Little Zombies: Seeing Cinderella: Not sure I'd want those glasses! Seeing Cinderella: Not sure I'd want those glasses! Rating: 4 Bites: Girls ages 9-13 will enjoy! Sixth grade is not going well for Calliope Meadow Anderson. Callie’s hair is frizzy, her best friend, Ellen, is acting weird, and to top things off, she has to get glasses. And her new specs aren’t even cute, trendy glasses—more like hideously large and geeky. But Callie soon discovers that her glasses have a special, magical perk: When she wears them, she can read people’s thoughts. Crazy glasses aside, Callie has more drama to face when she’s cast as the lead in the school play—and instead opts to be an understudy, giving the role of Cinderella to Ellen. 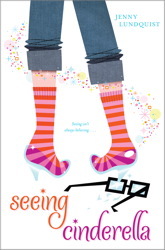 Can Callie’s magic glasses help her see her way to leading lady, or is she destined to stay in the background forever? Cute cover. And the back cover was enough to get me to check the book out. A girl who has glasses that could read other's thoughts. Bring it on. This should be fun. And it was! It's not a retelling of Cinderella. And that's okay. I did like how she's also a writer and writes little stories in the book. It shows that just a little bit of creativity can bring out an interesting story from those who try. Great for those interested in writing. Anyway-debut book of Jenny Lundquist. I enjoyed it! And those super cool (but ugly) glasses that can read people's thought....not sure I'd want a pair. Perhaps Lundquist has given us a good idea of what other's just might be thinking! Rating: Girls will enjoy it! I enjoyed it! A great one to add to their reading list. Disclaimer: There is some family dysfunction. Highlight for spoiler: Mother and father are separated. Father left because of another woman. Find it on Amazon here !